Polarstone™ quartz surfaces primary focus is skillfully combining timeless marble patterns with superior quartz technology. 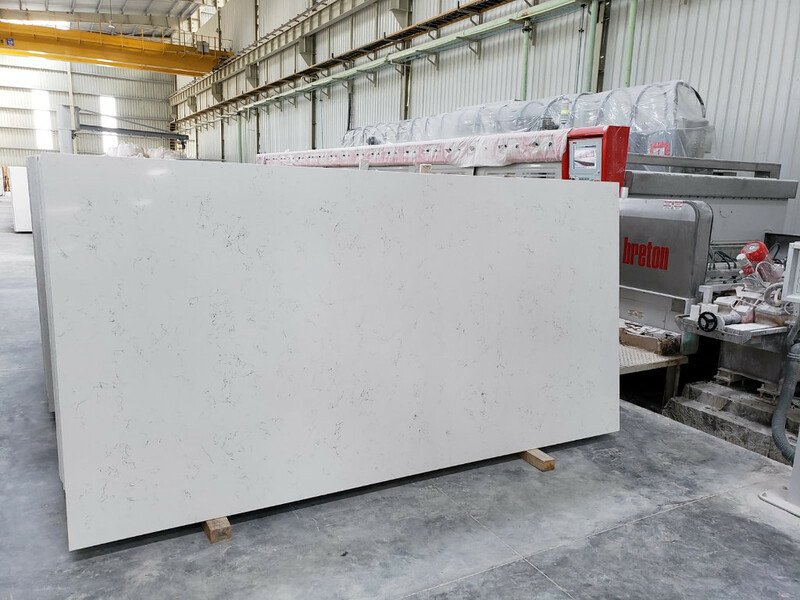 Extremely versatile, quartz slabs offer limitless possibilities for a variety of interior applications, with ease-of-use that’s second to none. Enormously popular overseas, sales of quartz countertops are on the rise in the U.S., encompassing all ends of the consumer spectrum from the luxury market to starter homes, and with good reason. Why Choose a Quartz Countertop & Slab? Quartz, the fourth hardest mineral on earth, is extremely durable, making a quartz countertop tough to scratch, resistant to heat, and safe from even the toughest stains from oils to coffee and wine. Low maintenance quartz countertops never need sealing or polishing, their non-porous surface hygienic and safe enough to meet National Sanitation Foundation (NSF) for food preparation applications. Taking safety to the next level, quartz countertops also release zero gases and VOCs, preserving the quality of your indoor environment. In addition, quartz slabs qualify as LEED certified “regional material” when fabricated within 500 miles of your project. Exquisitely crafted and beautifully finished, 93% natural quartz slabs are available in a polished or natural honed finished and a variety of edges. Color choice is nearly limitless, with new product offerings released regularly. Slabs measure 120”x 55” in thicknesses of ¾” (20 mm) or 1” ¼ (30 mm), and can be cut with ease into any shape from straight lines to sculpted curves. The versatility of a quartz countertop makes it an ideal solution for residential, commercial, hospitality, healthcare, and institutional applications, with unlimited design possibilities, including kitchen applications, bathroom vanities, desks, table tops, shower walls, partitions, and cladding. Offering only the most beautiful quartz slabs on the market, the quartz countertops available from Granite Imports can’t be found at your area box store. Granite Imports’ quartz countertops are exclusively sourced from high-end quartz slab manufacturers and only installed via professional fabricators. This winning combination allows us to back up the quality of our countertops with investment protecting product warranties on indoor applications installed by trained fabrication professionals. Ready to add the stunning appeal of a quartz countertop to your home or business? Visit your area Fort Collins, Grand Junction, or Denver Granite Imports today and view the latest in quartz slabs from the industry professionals in stone.